This winter Clayoquot Action is hosting a series of monthly Clayoquot Cafés. Each gathering will include an in-depth update on a different ecological challenge and a discussion using the World Café format. For January’s Café, the spotlight is on open-net pen salmon farming. Pesticide permits, tainted bloodwater effluent, fish farm occupations—there’s been a lot going on! Get up to speed and join the discussion. Local wild salmon populations are crashing, with returns numbering in the tens, rather than tens of thousands. No surprise—wild salmon are in exceptional decline everywhere salmon feedlots are in operation around the world. Suggested donation $5 (includes coffee, tea and yummy cookies). Doors at 7pm. Please come early for tea & chummus—event starts at 7:30pm sharp. 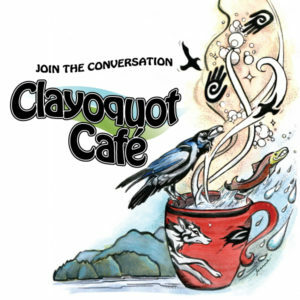 Next Clayoquot Café is Wednesday, February 28.